Tangerines are cold-hardy fruits that grow on a variety of types of tangerine trees. Tangerine trees thrive in subtropical climates, full sunlight and well-drained soil. As a group of the mandarin tree species, they are widely produced and well-suited for citrus fruit hybridization in which different varieties or species are cross-bred to create a new variety. Plant some of the more prominent tangerine trees for successful additions to your garden. Dancy is a variety of tangerine tree that displays deep-colored red-orange, medium-sized, pear-shaped fruit with orange flesh. 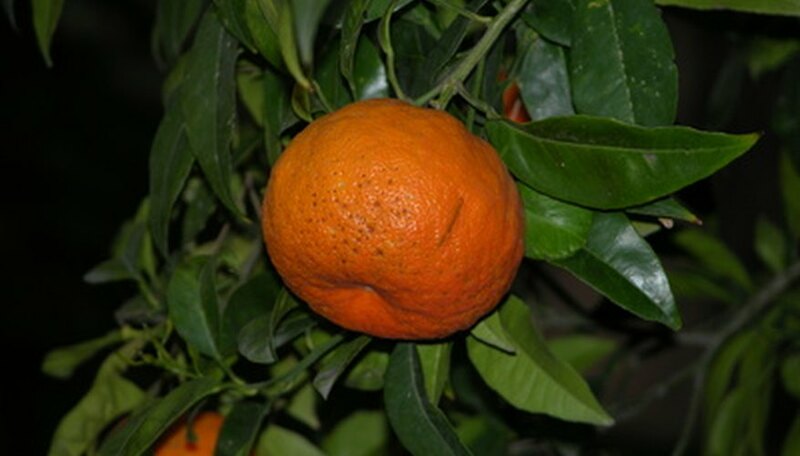 Dancy tangerines yield six to 20 seeds and have trouble staying on the tree in maturity because the rind peels easily. Clip dancy tangerines at harvest to avoid damage to the fruit. Harvest season is December through January, according to the AgriLife Extension. Dancy tangerine trees are large, erect trees that often produce alternating crops--a large crop of small fruit followed by a small crop of large fruit, explains the University of Florida IFAS Extension. The murcott variety of tangerine trees, also called honey tangerine, bears medium, red-orange fruit with a pleasingly flavored orange flesh, which are widely used for fresh fruit consumption. Murcott tangerines yield 12 to 24 seeds and hang tight on the branch, so tangerines may be picked by hand without rind damage, according to the University of Florida IFAS Extension. Harvest murcott tangerines during January through March, directs AgriLife Extension. The murcott tangerine tree is a small, upright tree with growth resembling a willow tree including drooping branches caused by heavy fruit. Though these trees are cold hardy, freezing temperatures will damage fruit, leaving it unfit for fresh fruit consumption. Satsuma is a tangerine tree variety that bears healthy fruit in areas with cool winter seasons and hot summers; subtropical climates are ideal. Satsuma tangerine fruit is a small to medium, flattened spherical shape with red-orange skin, "melting" red flesh and a rich flavor, according to the University of Florida IFAS Extension. Yielding 0 to 6 seeds, satsuma tangerines have loose rinds, so clipping fruit instead of pulling is essential to avoid tearing the rinds. A damaged rind may lead to decay. Harvest the fruit during November through December. Satsuma tangerine trees are low growing and medium to small in size, with drooping branches that display white flowers. When Is Cherimoya Fruit Ripe?